Tim Storrier has released a limited edition fine art archival pigment ink print Titled “The histrionic Wayfarer”, Sheet size 112 x75 cm, Image size is 97x65cm, the edition size is limited to 70 only, Waffarer is hand signed titled and numberd by Tim Storrier. 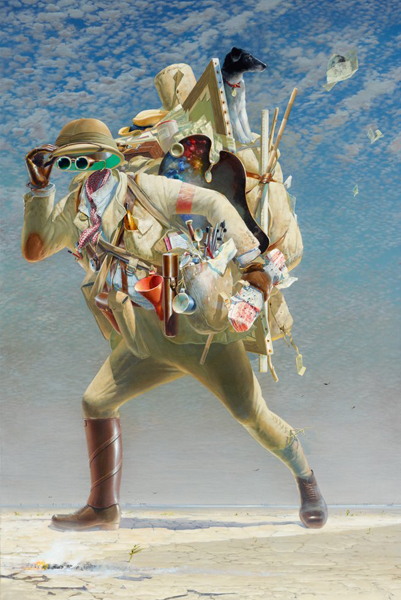 Tim Storrier was represented in the Archibald Prize with another self-portrait without a face. Entitled Moon boy (self-portrait as a young man), the figure was represented by a suit of empty clothes hanging as if on a scarecrow in a barren landscape. This year’s 2012 self-portrait is, as he notes, a work in a quite different mood. ‘It refers to a painting by Hieronymus Bosch called The wayfarerpainted in 1510 where the figure is believed to be choosing a path or possibly the prodigal son returning,’ says Storrier. ‘It also has other references, I believe, but they are rather clouded in biblical history and time. Though there is no face to identify him, Storrier believes that identity is made clear by the clothes and equipment carried. Storrier has included a drawing of himself in the painting, scribbled on a piece of paper being blown away by the wind. Born in Sydney in 1949, Storrier studied at the National Art School in East Sydney and now lives and works in Bathurst. Renowned for his mysterious, poignant landscapes that capture the melancholy vastness of the Australian outback, he has exhibited all over Australia and in Japan, Hong Kong, Singapore, New York and London. He won the Sulman Prize in 1968 at age 19 – the youngest artist ever to received the prestigious award – and again in 1984. His work has been collected by all major Australian art museums and is included in the collection of the Metropolitan Museum of Art in New York, the National Gallery of Australia and the Art Gallery of New South Wales among others. In 1994, he was awarded an Order of Australia (AM) for services to art.